At 9:15 PM on November 19th , Windham Area NAACP President Steffen Gillom sent me a text with a link to the VT Digger article announcing Senator Sanders’ 3-day progressive event in Burlington that was planned for this past week, it was followed by the question, “Did you know about this?” My first response was excitement. A progressive agenda that promised to raise an intersectional approach to ending injustice and oppression? In our backyard? As I read the roster and saw the names of my own idols like Cornel West, my initial response grew into hope. We would finally be heard and seen here in Vermont! But, as I neared the end of the star-laden roster, I began to wonder. How many leaders from Vermont were invited to speak? I reviewed the list again and saw only the name of Lieutenant Governor David Zuckerman. Okay. One. Then I wondered how many justice leaders from Vermont had been invited. Racial? None. Economic? None. LGBTQ? None. Immigrant rights? None. I read the article several times. Maybe I missed something? I thought progressive politics was about lifting the voices of common people. For a group that prides itself on grassroots organization, it seemed that this progressive event had forgotten its roots; the people of Vermont. How could Senator Sanders host what is supposed to be an intersectional, progressive event without inviting the very people whom he serves? If this is really about economic justice, where are the poor folks? If it is really about racial justice, why are there no local racial justice leaders? Chief Don Stevens of the Abenaki? Disability rights? Where is Justicia Migrante? I don’t see them on the list. I had a hard time believing that Senator Sanders would overlook the very people he serves as people who could speak to the issues. I also know that the Senator’s people had no problem finding me to talk about race in Vermont the day before he met with NAACP President Derrick Johnson last May. But really, there are plenty of other leaders who could speak. Surely someone in Vermont had to have been invited and they just weren’t included in the article because, really. Who here compares to Danny Glover? So I took to social media and posted the article, tagging various justice leaders that I knew. No one knew about it. I asked groups like Rights and Democracy, who posted an article to advertise the event, if they would be speaking. I heard nothing. 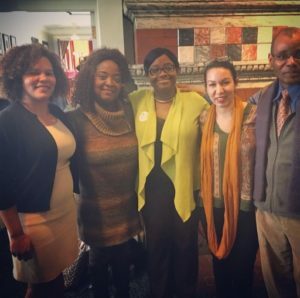 Even Kiah Morris, who was Vermont’s lone black woman in the legislature—that is, until the racist threats and harassment became so intolerable and intimidating that she not only had to withdraw from an uncontested race, but she stepped down from office just three months ago—was not invited. I write this not to complain about the fact that none of us were invited; I write this to point out the hypocrisy of the situation. How do you say that you are a person of the people, how can you be “awoken”, in the words of Victor Lee Lewis, when you come home to Vermont to talk about justice and institutional oppression and don’t invite the very people your represent? In speaking with other folks, I learned that I am not the only one who has noticed this omission. We hope that we are missing something, but if we are not, this is a either a major oversight or just one more example of how institutional oppression looks, even among those who are progressive.